Includes Postage within Australia & Worldwide! Please remember to send us your full address with post codes etc. (For other payment options please see below)! 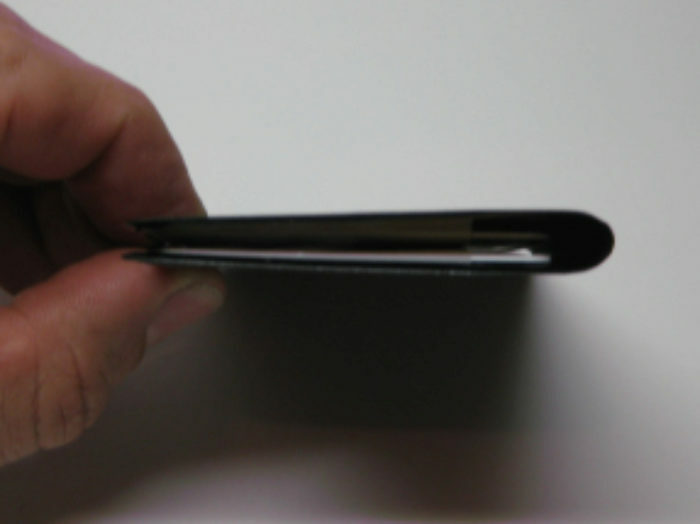 Internal Card Pockets have innovative thumb openings that allow cards to be quickly and easily removed. 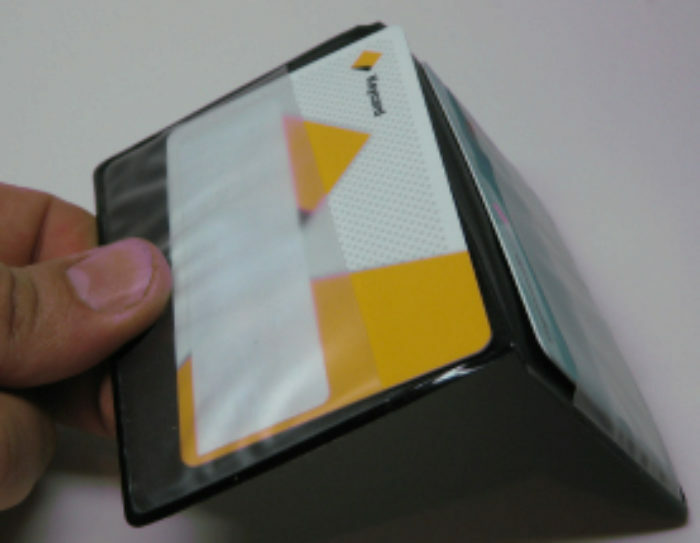 Our Speedex RFID Bank-Card Protectors are designed to hold 2 bank cards in transparent pockets and stop any radio waves passing through them and reaching your bankcards during storage. This means your bankcards will be safe and your banking details cannot be read unlawlawfully by thieves using RF card scanners. Our RFID Bank-Card protectors have ULTRA HIGH RATED SHIELDING!!!!!! 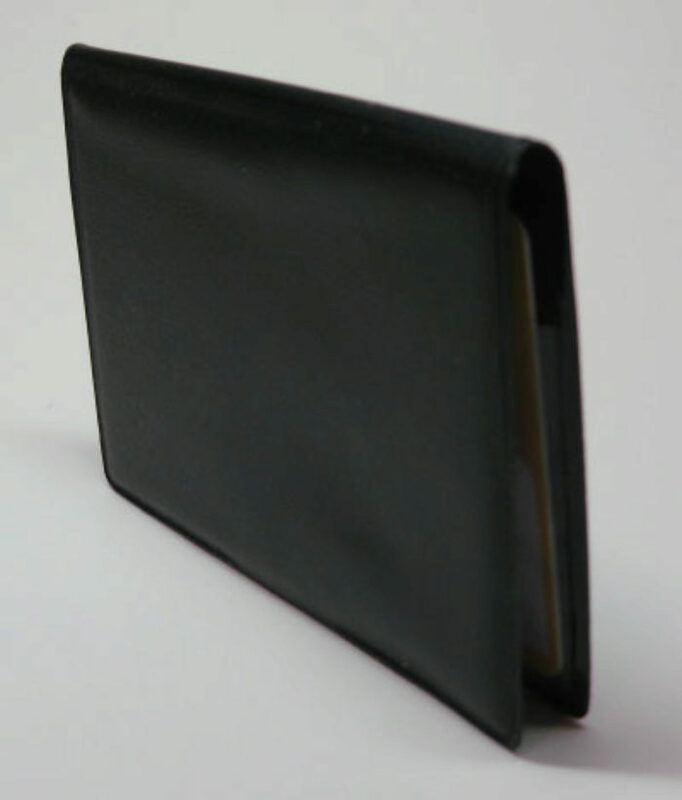 Our Speedex RFID Bank-Card Protectors easily fold and are slim enough to fit in any wallet or in your clothing. 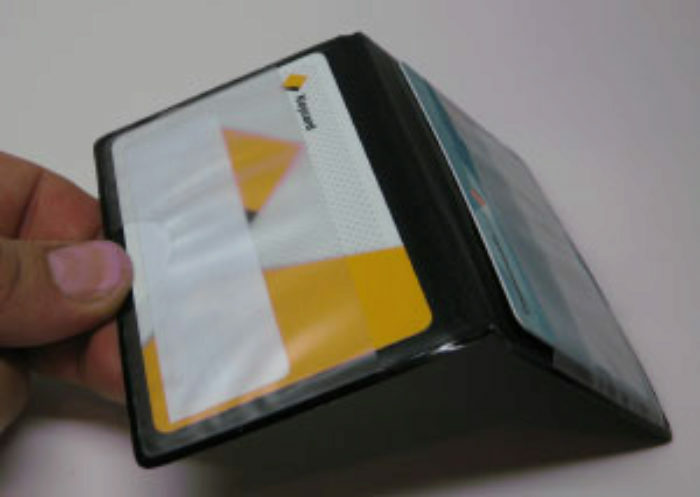 Transparent pockets allow cards to be easily accessed. Our Speedex RFID Bank-Card Protectors are also designed with easy to use "thumb openings" to allow cards to be ejected out of their pockets easily when taking cards out of our RFID Protectors. They provide full protection when cards are not in use at immediate close range and at any distance away from an RF scanner. Our RFID Bank-Card Protectors really do work!! And we have successfully tested them in the field. And our protectors are a quality product. We provide postage DELIVERY WORLDWIDE using Australia Post. We are now accepting Paypal direct online payments. R.F.I.D. means "Radio Frequency Identification." It is a well established existing technology which uses radio waves of a certain inaudible sound frequency to be sent out by a device to another device in order to identify it by the returning radio frequency. 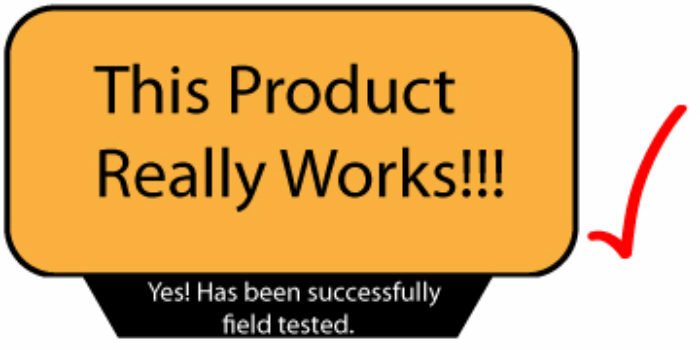 For example some products have R.F. (radio frequency) chips on them to act like bar codes, so a passing scanner can read what a product is by scanning it's radio frequency code, rather than reading its bar codes by optical means. Unlike a standard barcode on a packet of cornflakes which are relativley large so they can be easily read by an optical bar-code scanner eg., Radio Frequency Identification chips can be made microscopic in size or much smaller than standard barcodes and be also hidden inside a product whilst also being able to be scanned and read. RF identification chips also have the advantage because they are electronic components to be able to change their stored data according to inputs. This enables RF identification chips to be used in elctronic devices. The use of Radio Frequency technology is now emerging in the retail "payment" environment where newer "smart cards" or bank cards are fitted with a Radio Frequency chips which automatically reads your bank card information. So instead of a customer swiping a card at a cash register the card holder now only has to hold their bankcard infront of a Radio Frequency card reader and the purchase amount is automatically deducted from a customers bankcard without the need to key in a customer's pin number or password. RF Smartcards also do not have to be within line of sight or positioned in a certain way or slid into a bankcard reader, therefore they can just be held in any position/orientation in front of a RF scanner. This allows faster purchases and allows more customers to pass through a cash register in much less time than if you had to key in information. Therefore there is alot of interest in retail environments in adopting this new Smartcard technology as it allows quicker sales, smaller cues, and less staff to man cash registers. It also offers customers quicker service and shoppers goods to be more easily scanned which is a great advantage. 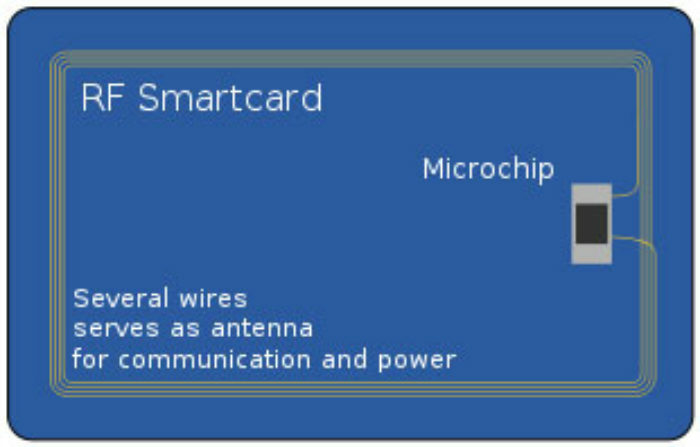 This is a picture of an RF Smartcard. The microchip can now be microscopic size and virtually undetected. However embedded RFID chips unlike other electronic chips in existing bankcards which rely on magnetic or optical chips always have the potential to be read by a passing RF card reader. And the RFID information on your bankcard cannot be "locked." This leads to the inevitable danger of bankcards in unsuspecting peoples pockets to be easily scanned by a passing thief using a RF scanner, without the need to physically steal a bank card off someone. Therefore peoples bankcards private details and account information can be stolen without any physical contact from as much as several metres away!! Our Speedex RFID Bank-Card Protectors have been brought on the market to fill a need to protect peoples bankcard account information from RF robbery. Our view is that this RF technology implemented in bankcards has its advantages and disadvantages. 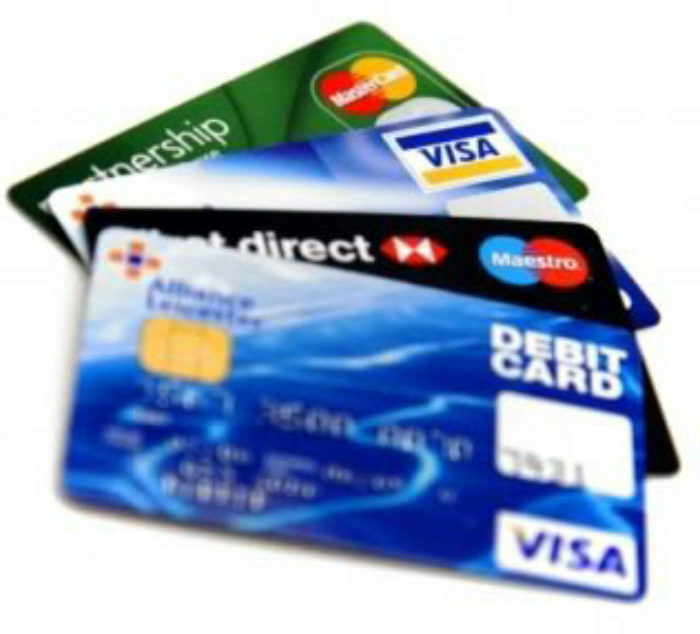 If you are wise and protect you bankcards from RF attack then you will enjoy the benefits of this technology. RFID chips in bank cards or Smartcards are currently being implemented by all multinational banks, credit card institutions and major retail companies, (American Express, Visa, Mastercard etc) so this RF technology really is here to stay. And while the technology no doubt does have considerable advantages to consumers(easy to scan purchases etc) there are some drawbacks which can be easily overcome by carrying your bank cards in our RFID bank-card protectors. Therefore you can have the best of both worlds, quick and efficient purchases using your RFID bank cards, and also being protected against any unwanted RF scanners. RFID works by a RF scanner reading a microchip on a bankcard by use of radio-waves. It is a wireless non-contact system that uses radio-frequency electronmagnetic fields to transfer data from a tag attached to an object or microchip embedded in a bankcard, for the purposes of automatic identification and tracking. In the case of bankcards, no battery is required and simply electromagnetic fields are used to read them. Unlike a bar-code, the tag does not have to be within the line of sight of the reader an may be embedded in the tracked object. The technology can be made microscopic so the chances are that in the near future you may end up having an RFID microchip in you new bankcard and not even know it or be able to visually see it or recognise its presence. Aternatively you check if your bankcard accepts RFID payments by visiting your local petrol station which now all have RF card reader technology implemented. RFID is making shipping quicker and more convenient. RFID is now being implemented in all major supermarkets, petro-convenience service stations, convenience stores, department stores and banks. American Express, Visa, Mastercard, Nokia, 7-Eleven, Shell, BP, Caltex, Kmart, Walmart, Woolworths, Coles, Myers, Bunnings, McDonalds. RF scanners, as cheap as $8 are easy for criminals to buy and read your bankcards account information without having to physically steal them from your person. 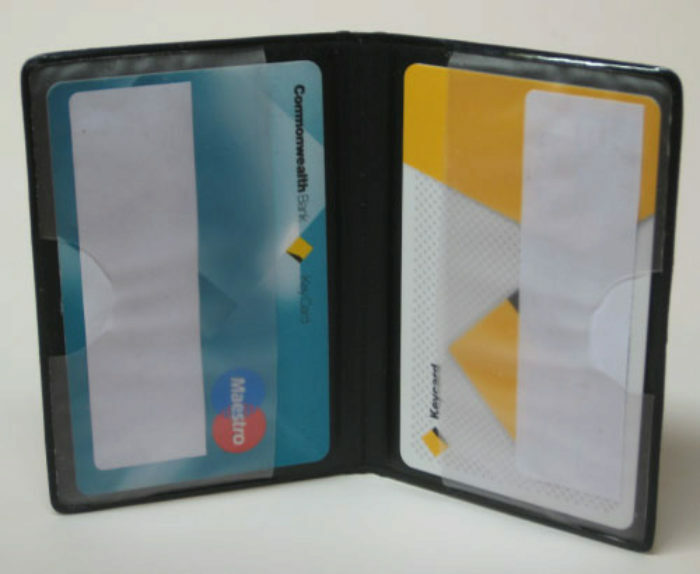 You should keep all your bank cards safe within a RFID Bank-card Protector so that your bank cards account information is not unlawfully stolen! Do not be a victim!! 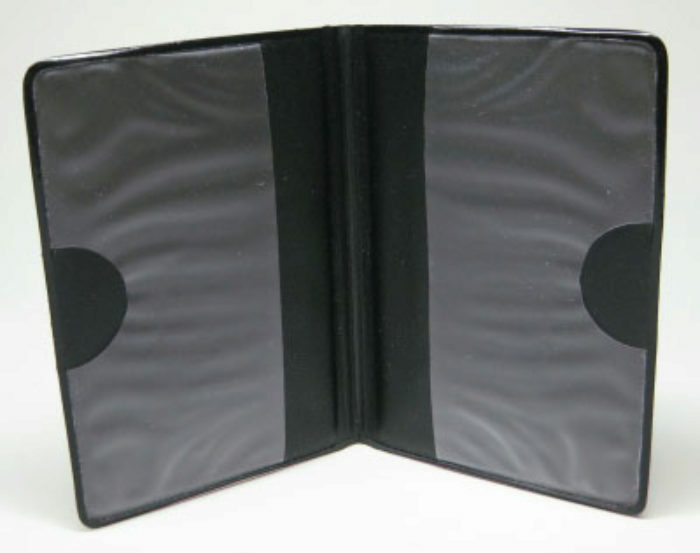 Buy and try one of our RFID Bank-Card Protectors Today! Payment : We accept Paypal, electronic payments, cheque, cash and credit cards. 3.Proceed to enter in your bank details. 4.Remember to include your full address with post codes in area provided so goods can be sent to your correct address. We also accept direct electronic transfer payments. So if you wish to pay this way, please write to us at speedex@speedex.com.au and tell us the product you wish to purchase with quantity and please remember to include you full delivery address with post codes. We can then send you our electronic details by email and process your order after electronic payment is made. Postage cost is included throughout australia and worldwide to most common destinations. Postage of Speedex RFID Bank Card Protectors are delivered in Australia Post Tough Bags for added protection in transit. If more quantities are required then please write to us.